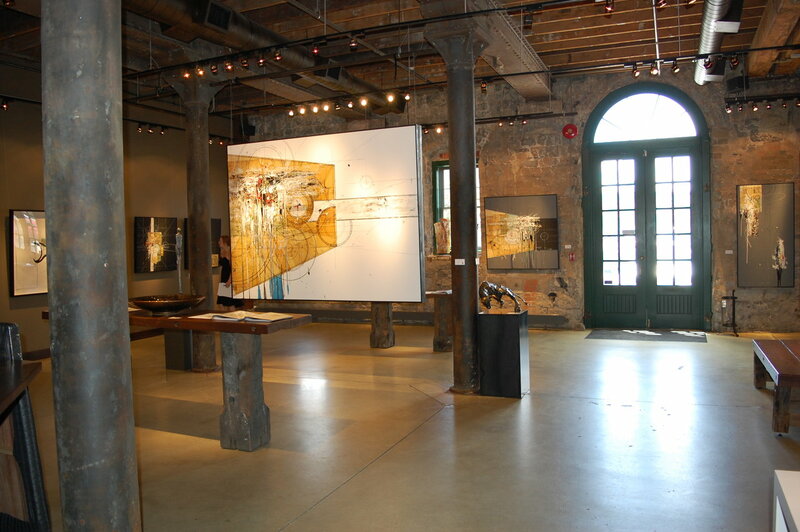 The Thompson Landry Gallery only exhibits Quebec artists. If the work of Étienne Gélinas is any indication of other art by Quebecers then it is easy to understand why the gallery chose to focus on this province’s artists. Gélinas’ present exhibition at the Thompson Landry Gallery, entitled Systemic Complexity, offers a different way of approaching art as well as academic pursuits. His paintings combine spontaneity of layers and patterns with more rigid mathematical equations, grids, and architectural elements. What is so wonderful about Gélinas’ work is the complexity that is embedded within each painting. The paintings viewed at a distance as an entire piece presents a curious image of abstract shapes and designs but upon closer inspection, you can truly grasp their intricacy. 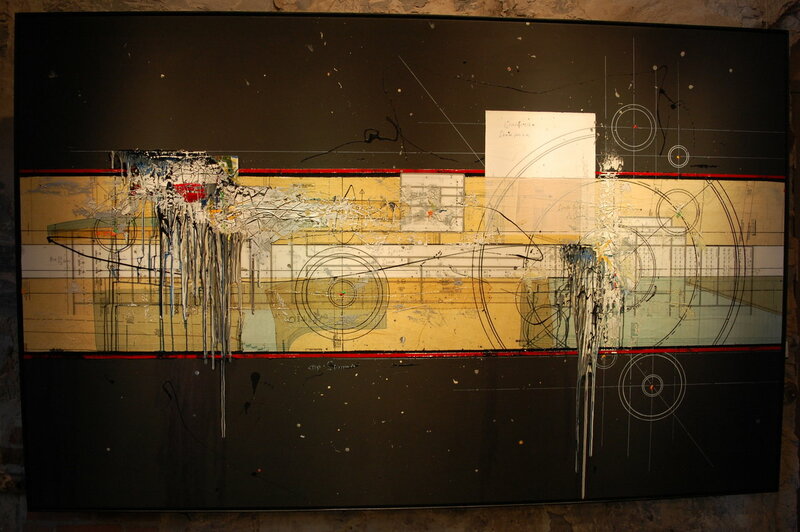 Étienne Gélinas, Composition 388, Mixed media on canvas, 60 x 96 inches. When zooming in on one region of one painting you are able to see the extensive detail the artist has incorporated: varying layers of paint, hidden mathematical equations (literally equations written out), and minute texts that seem like instructions on an architectural plan. It is once you have gotten up close and personal with the paintings that the ambiguity present is fully recognized. You find yourself getting lost in the mysterious scientific codes themselves but also their unique interaction with the drippings and splotches of paint that freely covers their surface. 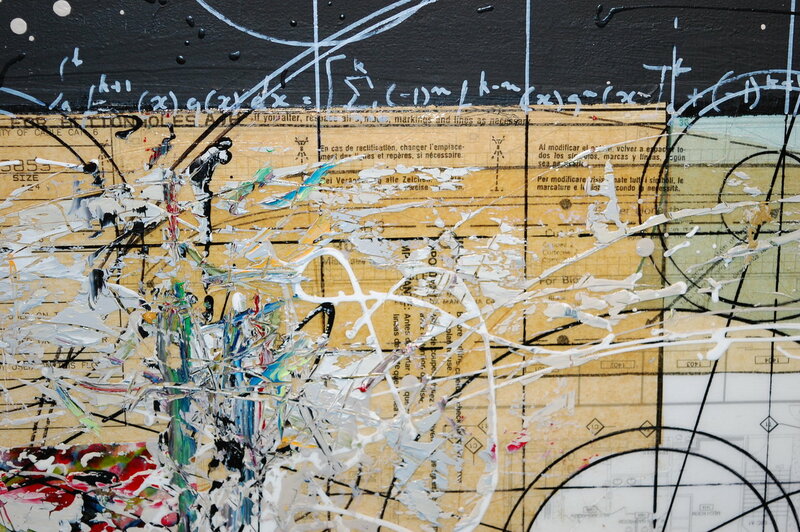 Étienne Gélinas, Composition 368, Detail, Mixed media on wood, 36 x 36 inches. Gélinas plays with the idea of engaging both sides of the viewer’s brain, the right, which deals more with visual imagery, and the left, which handles logic and mathematical reckoning. Close examination of the art simultaneously brings the viewer back to their school days of math and art class. Though all of Gélinas’ pieces contain the similar juxtaposition of order and freedom, each painting is unique in its own way, which can keep you at the gallery for hours. But who would protest to an afternoon of stimulating art located in the charming Distillery District?